Do you enjoy graphic novels? Of course you do! Would you like to make your own comic in an hour and a half? Sure you would! Then this all day event is just perfect for you. 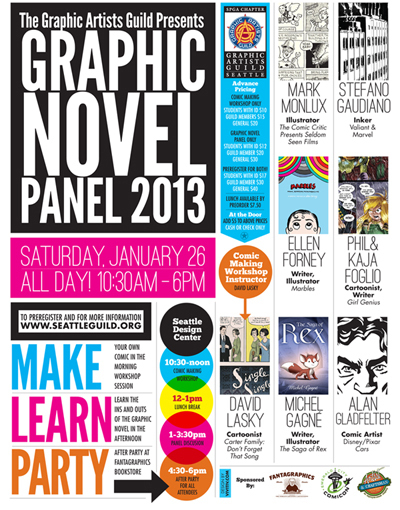 Put on by the Seattle Chapter of the Graphic Artists Guild, it features a stellar lineup of cartoonists, illustrators and writers currently at the top of their game. You like parties, don’t you? After all that knowledge and inspiration they’ve thrown at you, relax and attend the after party at Fantagraphics bookstore. Register here. You appreciate cool posters, don’t you? Who doesn’t? Well, we designed this one. 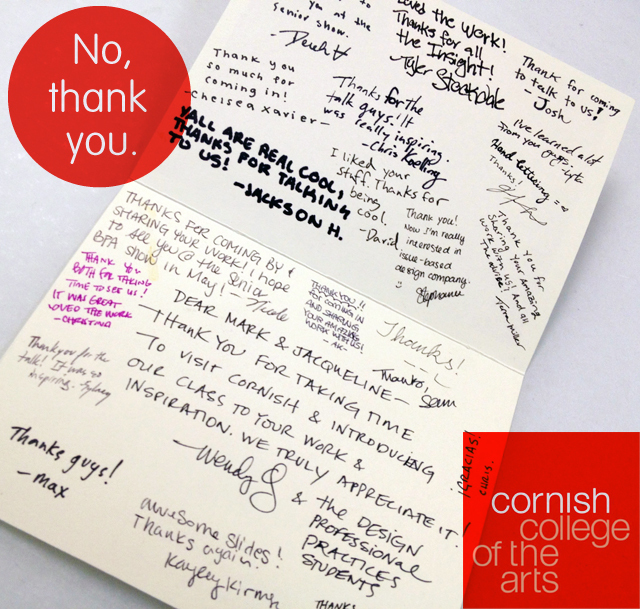 We received this lovely note of thanks after we spoke to the Design Professional Practices class at Cornish College of the Arts. It was our pleasure! A hearty thank you right back to Wendy Quesinberry and the students for having us! Today is the last day to pre-register to get a $5 discount for Vivitiv partner Jacqueline McCarthy’s Graphic Artists Guild talk on self promotion #winning and #fails. All attendees get one of these sweet Vivitiv branded knives. Our Own Worst Enemies? Yes. We practice what we preach. 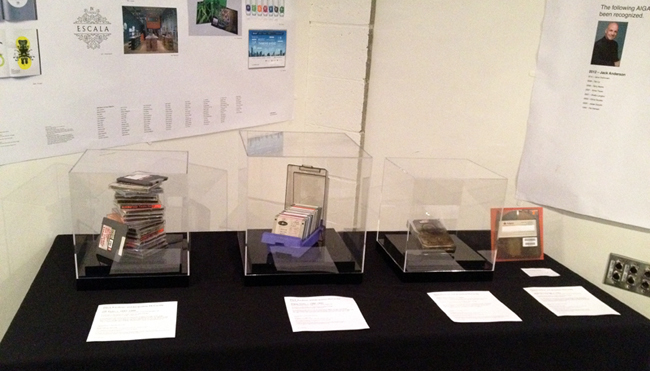 Over the years we’ve worked with some amazing WA based arts organizations. Here are a few logos we’ve done for the likes of the Seattle Symphony, Auburn Arts Commission, Seattle International Film Festival, the Seattle Opera, Seattle Repertory Theatre, Puget Soundscape, Seattle International Music Fest, Gorge Amphitheatre, Seattle radio stations, Washington Commission for the Humanities…Think Global, Design Local. We had a blast at the Design Family Reunion conference in Monterey, CA last week. The über patient Chris Sickels of Rednose Studio spent the day teaching a bunch of designers, illustrators and writer the painstakingly slow, yet fun art of stop motion animation. 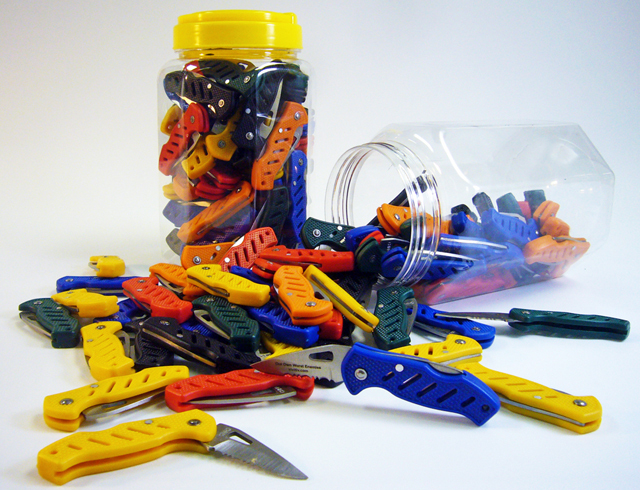 Chris supplied the set, props and his wonderful puppets that he designs and sculpts, all of which fit into a suitcase! This is what we did. Got to see some old friends from around the country and more importantly get to meet some new friends. More info over at the Rock, Paper, Ink blog. Our Own Worst Enemies. Jacqueline McCarthy on Self-Promotion. Vivitiv partner Jacqueline McCarthy will be giving a talk to the Seattle Graphic Artists Guild on September 26, 2012. Our Own Worst Enemies will focus on the triumphs and tragedies of over twenty years of self-promotional efforts. Sign up here.